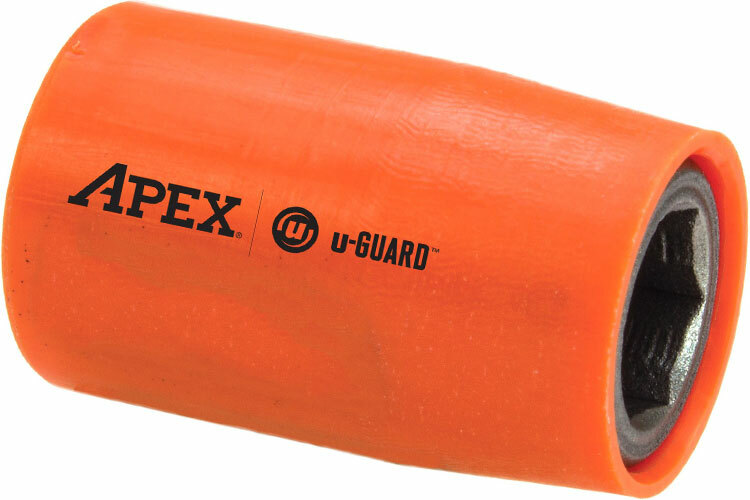 Apex u-Guard sockets offer the free-spinning design that provides maximum protection for polished and highly sensitive surfaces. The Apex u-Guard provides a protective barrier between genuine Apex fastener tools and your finely finished workpiece. The UG-MB-10MM21 Apex 1/4'' Square Drive Socket, Metric is one of thousands of quality tooling products available from MRO Tools. Please browse Apex u-Guard Sockets, 1/4'' Square Drive, Metric for tools similar to the UG-MB-10MM21 Apex 1/4'' Square Drive Socket, Metric. UG-MB-10MM21 Apex 1/4'' Square Drive Socket, Metric description summary: Apex 1/4'' Square Drive Socket, Metric. Fastener End Size (mm): 10mm Fastener End Shape: Hex Overall Length (in. ): 1.78'' Overall Length (mm): 45.2mm Drive Size: 1/4'' Square Drive Quantity discounts may be available for the UG-MB-10MM21 Apex 1/4'' Square Drive Socket, Metric. Please contact MRO Tools for details.